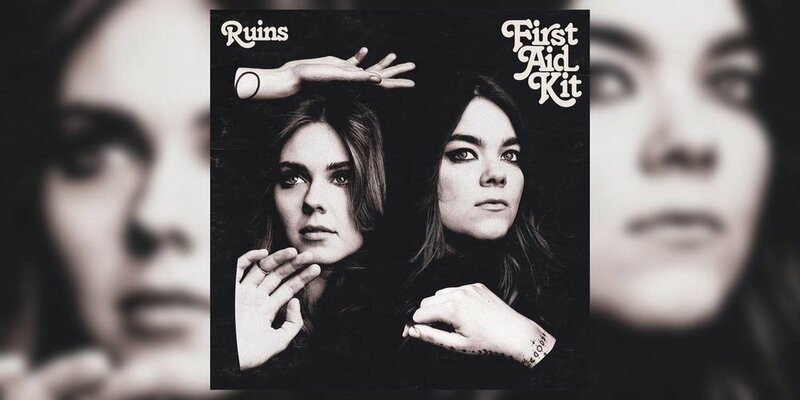 First Aid Kit, a folk duo comprised of sisters Klara and Johanna Söderberg, are a rarity in 2018. Their silky harmonizing and Americana-influenced style is unique, especially for two young women from Sweden. But on their fourth studio album Ruins, the follow up to 2014’s outstanding Stay Gold, they prove that it is a winning formula, despite its singular positioning in the world of pop music. The vocals do not compete against flashy production. Occasionally a song will meander, like in the first track “Rebel Heart,” creating a forgetful moment. The second, “It’s A Shame,” helps to recover the pacing, charging along with a quicker tempo and a catchier hook. The first half of Ruins leans towards simpler, slightly unremarkable folk. A passing beat is practically squandered if vocals are absent. “Fireworks,” the first single off of Ruins, is a sentimental ballad. The wistful harmonies, punctuated by deep percussion and twinkling piano, are lovely and engaging, a sparkling representation of the duo. “Postcard” has proper country strum and longing drawl, taking the tone to a honkytonk place. “To Live a Life” is a quieter version of First Aid Kit, with the focus on songwriting. The waltzing instrumentation has a thin layer of schmaltz, but is used sparingly. Equally divine is “My Wild Sweet Love.” The Söderbergs take their time, stretching each syllable into a lazy harmony. The final two songs on Ruins, “Hem of Her Dress” and “Nothing Has To Be True,” are toothsome, with harder strumming and a growl in their voices. “Hem of Her Dress” is the standout of the album, a raucous folk tune, in the style of Hurray for the Riff Raff or Martha Wainwright. “So here we are again, I know how this one ends” has the jaded sigh of resignation of a woman who’s had enough. “Nothing Has To Be True” closes out the album in epic fashion, all echoes and grandeur like a Stay Gold leftover. A touch of fuzzed-out feedback gives it some rock and roll grit. It’s a satisfying end to Ruins, the masterful, if slightly half-baked work of powerful folk artists. Ruins may not recapture the intensity of Stay Gold, but its strength lays in the duo’s swooning vocals and lyrical romance. Where it misses the loud, creative production of past albums, folk vocals with a little extra (those harmonies!) pick up the slack. Ruins is a charismatic, concise send-up of a style unclaimed by many young American musicians in 2018, but exquisitely executed by these special Swedish talents.